A long overdue debut on Live and Loud! 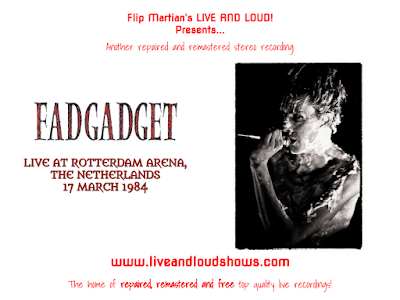 for one of the true originals in synthpop from the late 70s and early 80s - Fad Gadget. 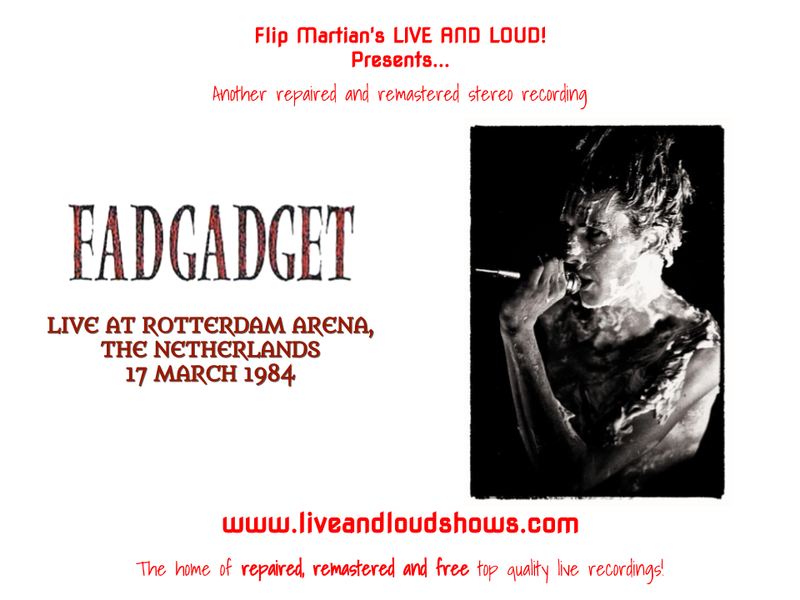 This is a show from The Netherlands from soon after the release of his 4th album, Gag. I imagine this must have been broadcast on Dutch FM radio at some point. Unfortunately the copy of the broadcast I was able to find had already been "worked on" by someone... When I loaded this show in my editor, the waveform was max'ed out completely - brickwall limiter clumsily applied, I guess. So it sounded hard on the ears and tiring to listen to - everything was LOUD (I know this site is called Live and Loud! but really, this was too much). So I set to work with the EQ to see if I could fix it - the worst of those excesses are now gone, it sounds far more rounded a recording and easier to listen to. With the added bonus of making the instruments easier to hear, tightening up and reducing the bass a bit, levelling off the top end and...all the usual stuff I do! Thanks Tomas - comments like that make MY day. Glad you enjoyed it, thanks for letting me know.